The newest ferry company operating from a Kent port is proposing to takeover a rival to save hundreds of jobs. LD Lines, which operates between Dover and Boulogne and Dieppe, said it would make a formal bid for SeaFrance. SeaFrance, which sails to Calais, this week said it may axe 650 French jobs to survive a steep fall in the cross-Channel freight market. Its owner, French rail operator SNCF, said it had not received any formal takeover proposals. Christophe Santini of LD Lines said the company was expanding and would save at least 350 jobs if the takeover went ahead. LD Lines began its passenger and freight services from Dover on 12 February, five months ahead of schedule. It is operating two daily return sailings to Boulogne and one to Dieppe, with a second ship being added from 1 July to allow seven return crossings a day. SeaFrance announced on Tuesday that was restructuring and could cut 650 jobs to try to survive the recession. 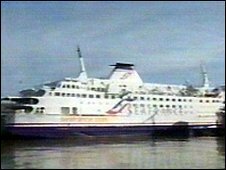 Mr Santini said that if LD lines took over SeaFrance the company would become a European leader on the ferry scene. Its size would make it possible for the company to survive the present economic environment. "I cannot divulge any information on the transaction itself, but we are talking about LD Lines taking over SeaFrance," he said. "The global group would keep the name of SeaFrance and we would be committed to preserve the vessels of SeaFrance under the French flag." He said there had been no response from SeaFrance shareholders. SNCF said it planned to take all necessary measures to guarantee SeaFrance's long-term future. "Given the serious current structural imbalance SeaFrance has to face, SNCF supports the recovery plan presented to staff on 17 February," it said in a statement.